This post was created as part of the Just Label It #ConcealOrReveal campaign in which I’m a compensated advocate for Mandatory GMO Labeling. All opinions expressed are my own. Lately it feels like that’s what we are doing, with all the mysterious ingredients that are being hidden in our food. 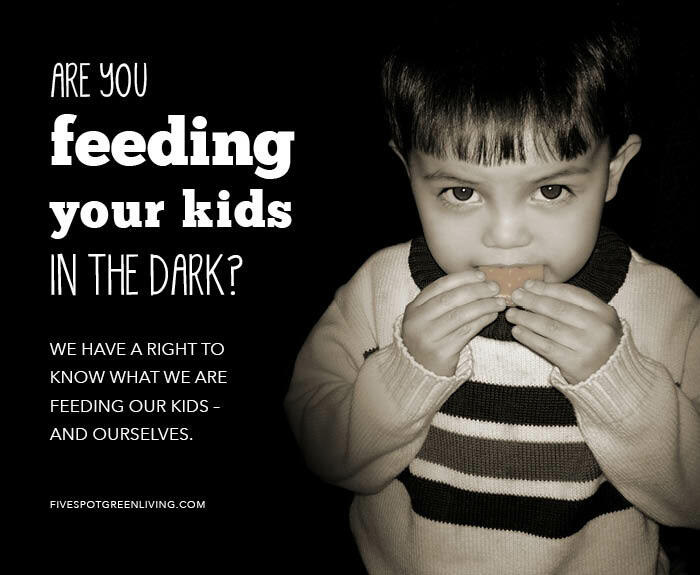 Do you feel comfortable feeding your kids in the dark? Giving them food that you THINK is healthy but who knows what’s really in it? Hey, it SEEMS like a wholesome treat so let’s just go on that. Um, no. Not me. And probably not you, either. Did you know there is actually a bill in Congress known as The DARK act (Denying Americans the Right to Know) which sets out to prevent mandatory FDA labeling of GMOs. This bill has gathered significant support from The Grocery Manufacturers Association, which has such members as PepsiCo, the parent company of Quaker Oats. With an image based on health and “wholesome goodness” Quaker is sending mixed messages by hiding what is in their products. Preempt states from regulating GMO crops to protect public health and the environment. Virtually eliminate FDA’s ability to craft a national GMO labeling system. Unlike other countries, the United States does not mandate the labeling of GMOs (or “genetically modified organisms”) which are are living organisms whose genetic material has been artificially manipulated in a laboratory through genetic engineering, or GE. This relatively new science creates unstable combinations of plant, animal, bacteria and viral genes that do not occur in nature. GMOs are made to withstand direct application of herbicide and evidence connects GMOs with health problems and environmental damage. Most developed nations do not consider GMOs to be safe. In more than 60 countries around the world, including Australia, Japan, and all of the countries in the European Union, there are significant restrictions or outright bans on the production and sale of GMOs. In the U.S., the government has approved GMOs based on studies conducted by the same corporations that created them and profit from their sale. GMO labeling will not increase food prices. Companies frequently change labels to highlight new innovations. GMO crops do not feed the world. Conventional and GMO corn and soybean yields have increased at the same rate. What’s more, U.S. farmers produce only 4% of rice, wheat, fruits, and vegetables, and most US corn and soybeans are used for animal feed and ethanol, not food. GMO crops have increased herbicide applications. Expanding the use of GMO crops has increased annual applications of glyphosate – a probable human carcinogen – from 16 million pounds to more than 280 million pounds. GMO crops have led to more toxic herbicides. As weeds have become resistant to glyphosate, farmers have turned to more toxic weed killers linked to cancer, Parkinson’s disease and reproductive problems. GMO crops have not reduced soil erosion. Adoption of soil-conserving farm practices were made in response to “conservation compliance” provisions of the 1985 Farm Bill, not GMO crops. Customers want to know if products contain GMO food ingredients and they feel betrayed by the brands they trust when they aren’t transparent about it,” said Joshua Ulibarri, Partner at Lake Research Partners, which conducted the poll. “They were even more concerned when they learned that these same brands fund efforts to block mandatory GMO food labeling. Just Label It recently released the results on a study, conducted by Lake Research Partners, that asked moms about the major food brands they buy. The study found that brands that either don’t label GMO food ingredients in their products, or support anti-mandatory GMO labeling efforts risked losing study participants as customers. The survey tested 3 trusted household name brands trusted by families for generations. One of those brands was Quaker, a division of PepsiCo. Nearly 70% of moms were less likely to purchase products from Quaker and its parent company PepsiCo when told that the company funneled millions of dollars into campaigns to deny consumers the right to know about GMOs. Nearly 93% of moms want Quaker to label GMOs. 80% of moms want Quaker to stop funding anti-GMO labeling efforts. 81% of moms surveyed said they’d be less likely to purchase a brand’s products if they found out that a company was using GMO food ingredients that contribute to the increased use of toxic pesticides. In just the last few weeks, over 100,000 concerned consumers have added their names to a petition calling for Quaker and Pepsi to support a federal law that would make GMO labeling mandatory. Add your name to this petition and let Quaker know that you want to know what’s in your food and that you support nationwide GMO labeling. Stand Up and Be Heard: You Want Mandatory GMO Labeling! Sign the petition and let Quaker know that you want to know what’s in your food. It’s a matter of being able to make an informed decision. People all across the country want to know what’s in their food. Speak up and let your voice be heard by signing the petition and let Quaker know you want mandatory GMO labeling. Then share this campaign with others. When we all speak up, the sound will be thunderous and one that big business won’t be able to ignore. Any Congressman or woman who votes to allow companies to deny our rights to know what we are eating is obviously owned by someone besides the votes that elected him/her.